Two-time NCAA champ and now NBA coach Billy Donovan has been a leader at creating scoring opportunities out of the pick and roll. In this video, you will learn Donovan's philosophy and the actions he uses within the ball screen offense. Coach Donovan believes in developing his offense based on what is most difficult for the defense to stop. You will learn how to exploit the weakest areas of the opposing team's defense as Coach Donovan shows you how to execute a fast break on makes and misses, play out of concepts in your offense and use over 10 set plays against man-to-man defense. For good measure, Coach Donovan also discusses his zone offense. To understand man-to-man offensive concepts, Coach Donovan describes three of the hardest concepts to master defensively: scramble situations in transition, closing out, and two people on the ball. He builds his man-to-man concepts off of these defensive flaws in order to take advantage of pick and roll scoring opportunities. Defenses are most vulnerable in transition before they can set up. 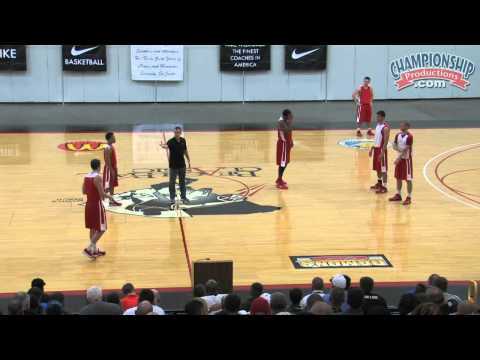 You will learn to maximize these opportunities with Coach Donovan's fast break system. You'll see how to run a structured break after a made basket that provides your point guard with space to drive and create plays. If there is no early score in transition, Donovan demonstrates multiple options on how to flow directly into his ball screen offense. You will also see how to break off missed shots without assigned roles. In this attack, multiple players can start the break and the spacing naturally takes on a variety of alignments. Coach Donovan also discusses how your big players can make reads in transition to run into ball screens. Within the pick-and-roll concepts, Coach Donovan shows concepts that maximize spacing and force the defense into constant help-and-recover situations. He shows you the reads your players will need to make to flow into ball screens and other actions within your offense. Donovan teaches three basic principles that every coach must understand to be successful using pick and roll action: shallow cuts, slip screens, and using screens. With each action, he details how players can look to penetrate and look for the extra pass, along with a mismatch out of the pick and roll. You'll see how your low post can make decisions involving running into ball screens, double ball screens or posting up. Also covered are freeing up ball screeners with a baseline runner action, wide pin downs, and how to re-balance the floor in different scenarios. By allowing players to make decisions on the court, your offense will become unpredictable and counter defensive strategies. Once Coach Donovan breaks down his concepts and principles, he puts everything back together in a series of man-to-man and zone offensive sets. Over 10 different man-to-man sets are provided, along with three zone sets and concepts to utilize the pick and roll in the half court. Coach Donovan uses some of the hottest sets in basketball today: "Floppy", "Horns", elevator screens and the spread pick and roll. Every set is different and all can be easily implemented into your offense.